According to the Bio-georaphic classification (Rodgers & Panwar ,1988) Ranthambhore Tiger Reserve falls in 4 B (Semi-arid zone and Gujrat-Rajwara biotic province). The area forms a transition zone between the true desert and seasonally wet peninsular India. The forests are mainly of edaphic climax and belong to the sub group 5B- Northern Tropical Dry Deciduous forests and subgroup 6B -DS1-Zizyphus scrub. The degradation stages found here are DS1-Dry deciduous scrub and SS4 -Dry Grass lands (Champion & Seth ,1968) according to the vegetation map prepared by French Institute, Pondicherry. The area is representative of dry deciduous Anogeissus pendula Forests sub type in association with Acacia, Capparis, Zizyphus and Prosopis species. (Ref: Project Tiger Management Plan 2002 - 2012). (a) Steep slopes and cliffs: The vegetation on the steep hills is very scanty and the plants like Sterculia urens, Euphorbia neriifolia etc. are found scattered without having any significant under growths due to absence of deep soil. Out of all the different floral habitats of reserve, these are the least disturbed by human activity. This is because such habitats are the least accessible and and have the lowest "harvestable resources". the annual biomass production is low in such habitats. However, they are crucial habitats for a large number of reptile and birds, particularly the endangered Long-billed vultures. (b) Gentle slopes of hills: The gentle slopes maintain comparatively luxuriant vegetation due to better soil formation and water holding capacity. The typical dry deciduous elements found here are - Anogeissus pendula, Sterculia urens, Boswellia serrata, Acacia catechu, Acacia leucophloea, Cassia fistula, Butea monosperma etc. Anogeissus pendula is the most dominant species here. The shrubs and under shrubs (mainly Grewia flavescens (seyali) and Caparice sepiaria. (jal) ) and some climbers further increase the density of flora. Various herbs form green carpets on the slopes, particularly during rainy season and just after the rains. The biomass production in thee habitats is very high and these are very heavily used by almost all the wildlife. Outside the Ranthambore national park, in all the parts of the Ranthambhore Tiger Reserve, it is in this habitat that the competition between wildlife and domesticated cattle is the highest. (c) Plateaus: The open flat rocky areas maintain stunted and sparsely distributed trees and shrubs due to very thin layer of soil. However, the grasses, seasonal herbs and shrubs are abundant, except in the dry season. The biomass production is the plateaus or the dangs is very low and highly seasonal. During the monsoon months, there are abundant grasses and herbs in the plateaus but soon after they dry out. These habitats are heavily used by wildlife and domesticated animals during the monsoons but sparingly after that. (d) Valleys: The valleys are characterized with fertile soil, sufficient watercourses, maximum Humidity etc. As a result, it supports comparatively thick vegetation and some Evergreen elements also do exist. The common trees found here are Anogeissus pendula (dhok), Syzygium cumini (jamun), Diospyros melanoxylon (tendu), Holoptelea integrifolia (chirail), Ficus benghalensis (bar), F. racemosa (gular), Launea coromandelica (gurjan), Butea monosperma (chila), Ziziphus mauritiana (ber), Bauhinia racemosa (sainta), Tamarindus indica (imli), Cassia fistula (amaltas), Mitragyna parvifolia (kadam) , etc. The shrubs and under shrubs further make the vegetation dense and impenetrable at certain spots. The most common of these plants are Adhatoda vasica (adusa), Caparice sepiaria. (jal) and Grewia flavescens (siyali). The valleys also have the greatest variety of climbers, herbs and grasses. The valleys have the highest biomass production of all the habitats in the reserve and should be the prime wildlife areas. However, outside the Ranthambore national park, the valleys are inhabited by human settlements and are highly disturbed for the wildlife. Inside the Ranthambhore national park, they are have the highest density of wildlife that is found in the entire reserve. (e) Lakes, reservoirs and its surroundings: These habitats provide variable plant communities controlled by the moisture content. The low-lying areas are also inhabited by certain trees like Phoenix sylvestris (khajur), Ficus bengalensis (bar), Tamarindus indica (imli), Flacourtia indica (kakoon) etc. 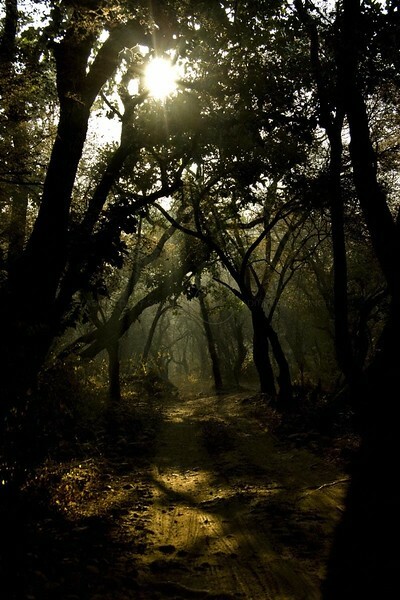 Most of the wetlands of the Ranthambhore, except those in the Ranthambore national park, are highly disturbed. Long periods of use by humans for cattle, irrigation, fishing etc have taken a big toll on these habitats. (f) Sandy plain : The species like Acacia nilotica (babul), A. leucophloea (ronjh), Capparis decidua (karil), . Prosopis juliflora (vilayati babul), Calotropis procera (ankra), Argemone mexicana (satyanashi) etc. inhabit flat sandy localities - locally known as bhura - of the Reserve. These are highly disturbed in the reserve. Grazing by cattle and goats have destroyed most of the ground cover and Argemone mexicana has invaded this habitat in many areas.